There’s no let up in theatrical activity as we approach Christmas, with a series of repeats, reprises and returns around town, including the first London revival of Cats since the original production ended a 21-year run in 2002, the RSC heading back to the Barbican, another RSC show transferring (belatedly) to the Almeida, Nina Raine’s Tiger Country back at Hampstead, and a new production for the Broadway musical City of Angels – previously produced in the West End in 1993 – among the highlights. The RSC hasn’t had a permanent London home since it formally withdrew from the Barbican in 2002. But while the Barbican has come to thrive in the years since as an international theatre and dance centre, the RSC has struggled to put down roots anywhere beyond its Stratford-upon-Avon home, so it is interesting to see the company go full circle to become a visiting company at the Barbican again. After last year’s sell-out season of David Tennant’s Richard II, it now transfers its double-bill of Henry IV Parts 1 and 2 to the venue, opening on December 11 with Antony Sher starring as Falstaff, Jasper Britton as Henry IV, Alex Hassell as Prince Hal and Paolo Dionisotti as Mistress Quickly in RSC artistic director Gregory Doran’s productions. The lack of a proper London home meant that Rupert Goold’s 2011 RSC production of The Merchant of Venice has never played in the capital, but now that Goold is in charge of his own theatre, the Almeida, he is reviving it from December 15 at the venue.The cast is led by former Almeida supremo Ian McDiarmid as Shylock, replacing Patrick Stewart who played the part in Stratford, and Susannah Fielding returns as Portia. Meanwhile Cats — originally directed by Trevor Nunn when he was still at the helm of the RSC — returns to London, this time to the London Palladium rather than the New London where it originated, opening December 11. Nunn, original choreographer Gillian Lynne and designer John Napier regroup to recreate it, with American pop and stage singer Nicole Scherzinger — a member of The Pussycat Dolls — playing another famous pussycat, Grizabella. At the Donmar Warehouse, Josie Rourke directs a new production of the 1989 Broadway musical City of Angels that won the 1990 Tony for best musical. Written by Cy Coleman, David Zippel and Larry Gelbart, its original West End transfer from Broadway to the Prince of Wales ran for just eight months, but won the Olivier Award for best musical. Now it fields a stellar company led by Hadley Fraser, Rosalie Craig, Samantha Barks and Rebecca Trehearn. Although the run is entirely sold out, £10 Barclays Front Row seats are released at 10am every Monday for performances two weeks ahead. Nina Raine’s Tiger Country about life on the frontline of the NHS, returns to its original London home, opening on December 15, newly starring Indira Varma and also featuring Tricia Kelly, Jenny Galloway, Shaun Parkes and Luke Thompson. At Hampstead Downstairs, the world premiere of debut playwright Rose Heiney’s Elephants runs from December 11 to January 17 in a production directed by Tamara Harvey. Heiney has hitherto been best known for her TV work that includes work on Miranda, Fresh Meat and Big Bad World. The cast includes Imogen Stubbs, Jonathan Guy Lewis, Bel Powley and Helen Atkinson-Wood. 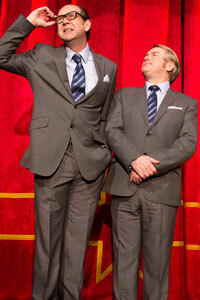 A hit Edinburgh Fringe homage to one of comedy’s great double acts, Morecambe and Wise, plays a second London season at the St James Theatre, opening on December 17. Created and performed by Ian Ashpitel and Jonty Stephens, this newly extended version features classic material including the original Greig Piano concerto sketch and Eric’s take on Shaksspeare. 1927 bring Golem, its first new theatre show in four years to the Young Vic, opening on December 12. Directed and written by Suzanne Andrade to combine live performance and animation, it follows the story of Robert Robertson and his life-changing purchase. Meow Meow brings her latest show Apocalpyse Meow: Crisis is Born to the Purcell Room for a Christmas season, opening on December 17 for a short run to December 29 as part of Southbank Centre’s Winter Festival. The new Bridge House Theatre in Penge inaugurates its first in-house show, with co-artistic director Guy Retallack directing the UK premiere of Tony Palermo’s It’s a Wonderful Life, paying tribute to both the golden age of radio and to Frank Capra’s film of the same name, opening on December 11. A double bill of Dickens opens at Trafalgar Studios 2 on December 12: Linda Marlowe in Miss Havisham’s Expectations and James Swanton in Sikes and Nancy. The annual Richmond Theatre panto brings local resident Jerry Hall onstage to make her panto debut as the Wicked Queen in Snow White and the Seven Dwarfs, opening on December 11. WYP is refreshing parts of White Christmas that the stodgy West End version of the Irving Berlin film-to-stage classic at the Dominion can’t reach. London only has a bigger band. Otherwise, Leeds has the edge with a production that is altogether less bland and more punchily cast. 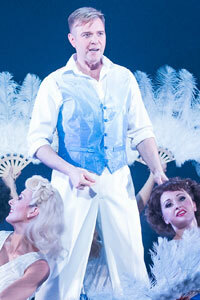 The superb company includes stellar turns by Emma Williams, Oliver Tompsett and Melanie La Barrie. Williams is one of our most classic (and classy) leading ladies of musicals: what a voice, presence and charm. As for Tompsett, I know him more for his rock shows like We Will Rock You and Rock of Ages, but it turns out he’s also a classical leading man. Now extended to January 24. The Crucible’s production of Cole Porter’s 1930s classic Anything Goes turns out a five star winner (see my review for The Stage). An umissable evening of sheer musical theatre heaven. After Sheffield, it embarks on a 33-date countrywide tour.